SINGAPORE - There were 199 dengue cases reported last week, marking the second time this year that the weekly figure had dipped below 200. The figure was 13 cases fewer than the previous week, according to the latest figures provided on the National Environment Agency's (NEA) dengue website. Another 33 cases of the mosquito-borne virus were reported from Sunday (May 29) to 3.30pm on Monday. A total of 8,163 cases have been recorded since Jan 3. Five people have died from dengue this year, one more than the four deaths reported in the whole of 2015. The latest death on Sunday was that of a 79-year-old Chinese Singaporean man who lived near the Eunos area in Jalan Tenaga, an active six-case dengue cluster. As of Monday, there were 42 active clusters, with eight classified as high-risk. 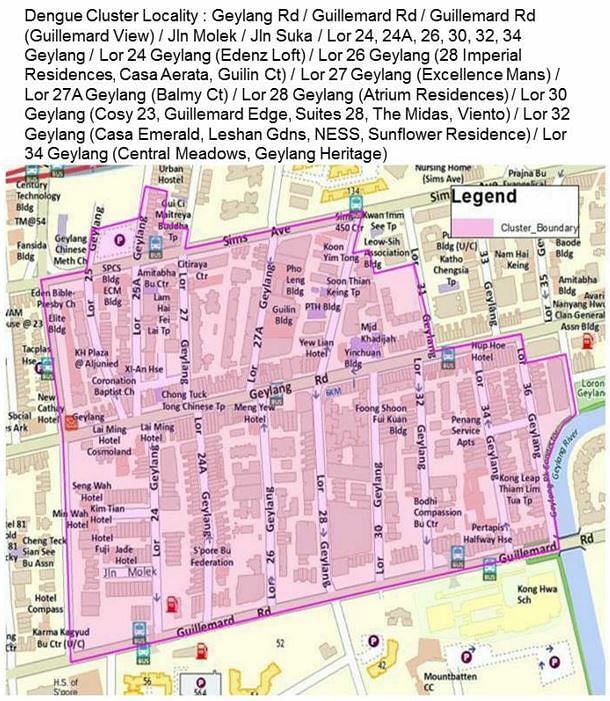 An area in Geylang was the highest risk with 71 cases reported thus far. With Singapore now entering its traditional peak dengue season, the NEA has repeatedly urged the public to sustain prevention efforts and do their part in reducing the adult mosquito population. A new app and educational portal on dengue and Zika were recently launched as the authorities sought to equip the public with more knowledge in its fight against the viruses.